The next upcoming Diwali is on Sunday October 27, 2019. 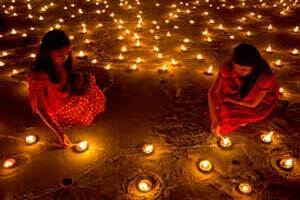 Diwali is held on 15th day of the month of Kartika in the Hindu calendar and celebrates the festival of lights. This is a Hindu festival that signifies the victory of light over darkness . People celebrate through fireworks, gifts, prayers, feasts and social gatherings. The main focus is lights and candles along with sparklers and other elements of light. Diwali is not a national federal holiday but is celebrated globally where ever Hindus live and is one of their most popular celebrated holidays.